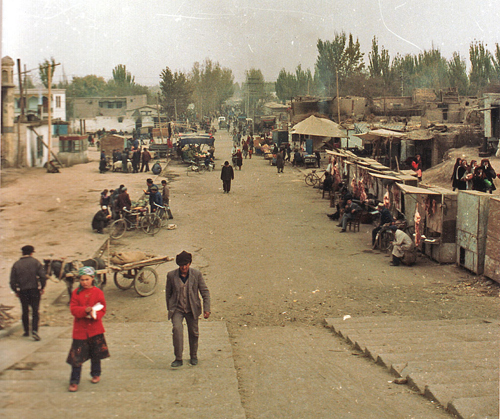 My reaction is one of horror, first of all for selfish reasons: I visited Kashgar twice, in 1990 and then again in 2002, and I still have romantic images of the Old City. 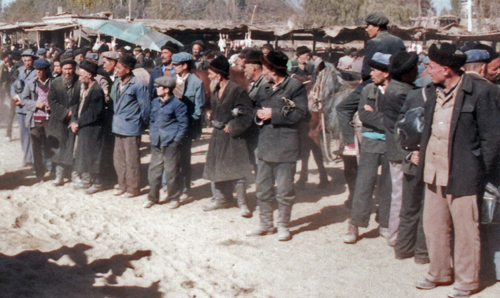 From 1990, I remember the Uyghur story tellers and street comedians performing to huge crowds in front of the Id Kah Mosque during the day, and then at night the food market with its smoking spits, emitting wafts of roasted meat and grilled fish. The back streets were a hive of activity where you’d be drawn to bakeries by the smell of freshly-baked bread, or you’d pop you head into a blacksmith’s to see horse shoes being smelted. The humongous Sunday Market was stunning: the whole town was clogged up with traders driving in on donkey and camel carts to sell their wares. Meanwhile, in the animal section, prospective buyers busied themselves inspecting cows, or ‘test driving’ a new horse or camel. Finally, there was the availability of cold beer and Kashgar Pizza which, after 6 weeks in Pakistan, was manna from heaven. 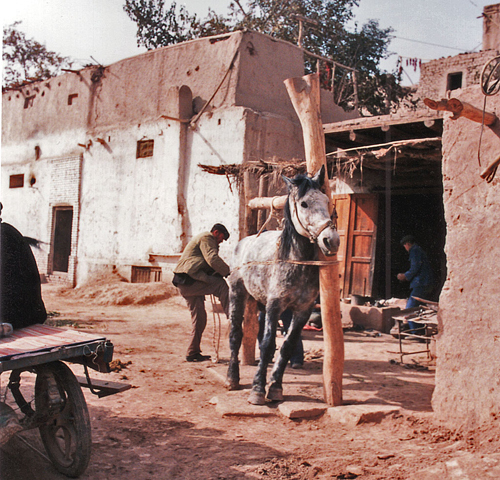 By 2002 things had already changed in Kashgar, especially on the outskirts, where a soulless Chinese white-tile town had sprung up, surrounding and moving in on the Old City. In 1990 we got lost for hours, trying to find Abakh Hoja’s Tomb. We cycled through a maze of alleys and mud- brick walled compounds with elaborately ornamented and carved doors. We passed the odd mosque, came across farmers using donkeys to thresh the corn, children tending to herd of goats, or even real Bactrian camels. It was amazing. In 2002, a huge asphalted road led directly to the Tomb. On both sides of the road new apartment blocks had sprouted up, replacing the maze of alleys. 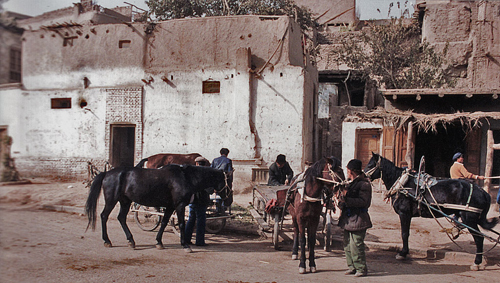 However, the central part of Kashgar’s historic city was still pretty much intact. So much so, that in 2006 the American filmmaker Marc Forster used Kashgar as a location to shoot part of the film ‘The Kite Runner’. 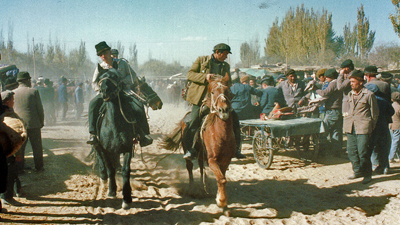 Kashgar was chosen because “its traditional Central Asian architecture closely resembles that of the Afghan city of Kabul in the time the story takes place…”. 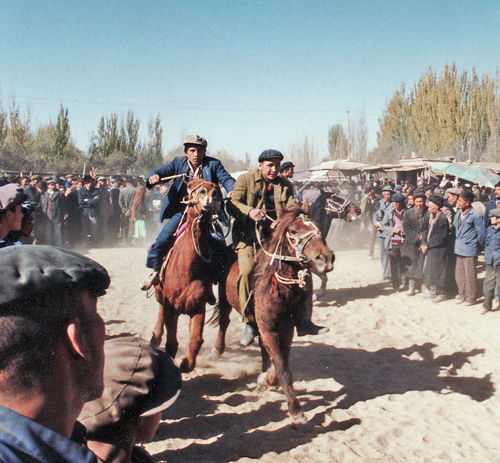 Moreover, the people of Kashgar seemed to be enjoying a newly-found sense of prosperity and were certainly much more receptive to visitors than they had been back in 1990. We particularly noticed this in the Sunday Market, where we were greeted by smiles all around and nobody seemed to mind our camera in the least. However, there was another change to the market that we liked much less: the animal section, which formed such a fascinating part of the Market and which had originally been located in the centre of town, had been moved to a more sanitized open space, way out near the railway station. Perhaps just one of the tell-tale signs of the Market’s diminishing importance. Just before leaving the city, we did realise that some winds of change were blowing, when we read that the local authorities had plans to remodel the bustling and vibrant square in front of the Id Kah Mosque, and replace it with a ‘civilized park’. Of course sanitation and cramped living conditions in the Old City were a problem. Besides, the maintenance of many old buildings left much to be desired. 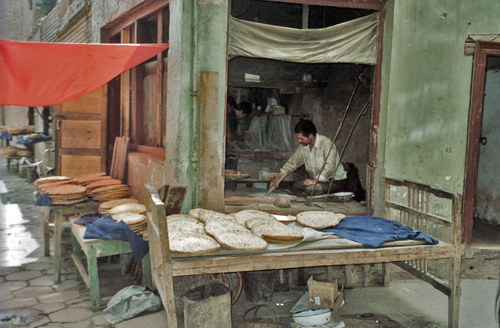 Kashgar was, however, a real living Uyghur city that oozed Uyghur and Islamic culture. This leads us to the other, more sinister, motives the Chinese authorities may have for their intervention: by destroying the Old City and relocating its inhabitants, would they not find it easier to control and kerb Uyghur nationalist feelings? Speaking about the relocation of those residents: there are already indications that the compensation being offered to owners and dwellers to move out of their homes and businesses is inadequate. The authorities claim they can relocate to new buildings in the centre. However, there are fears that they will be forced to leave and live in new featureless and shoddily- built apartments on the outskirts; as has happened in all historic cities that have bitten the dust in China’s recent modernisation. What’s more, given the overall quality, or lack of it, of this type of apartments, they are quite likely to fall down in the event of an earthquake (see dofu jianzhu). There are people, including Chinese academics such as Beijing architectural professor, Wu Dianting, who are trying to stop the destruction of the Old City. Unfortunately, their efforts will probably be in vain, as the demolition has already commenced in earnest. 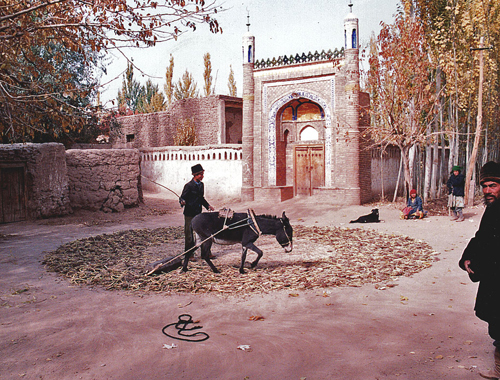 Many defenders of the Old City point to its tourist potential: Kashgar receives a million tourists every year, and many argue that a restored and sanitised Old City could play an important role in promoting tourism. While I believe that protecting the Old City, for whatever reason, is a welcome development, I can’t help asking: why is it that historic cities are never protected, restored and improved with the well-being of their original habitants in mind? An Old City, restored for the sake of tourists, will bring with it all the crass souvenir stalls, hordes of tour groups and a surge in upmarket restaurants and boutique hotels for the well-to-do. The original inhabitants will no doubt be forced out for economic reasons, and the town will be converted into a museum, rather than a living and breathing place. Lijiang, Dali and Suzhou are fine examples of this type of development. I was looking for articles about Yuanyang and I found your site. I was in Kunming recently but didn’t go to Yuanyang much to my regret. The old quarter in Kunming is so tiny and I think they’re working to preserve it. Thank God. 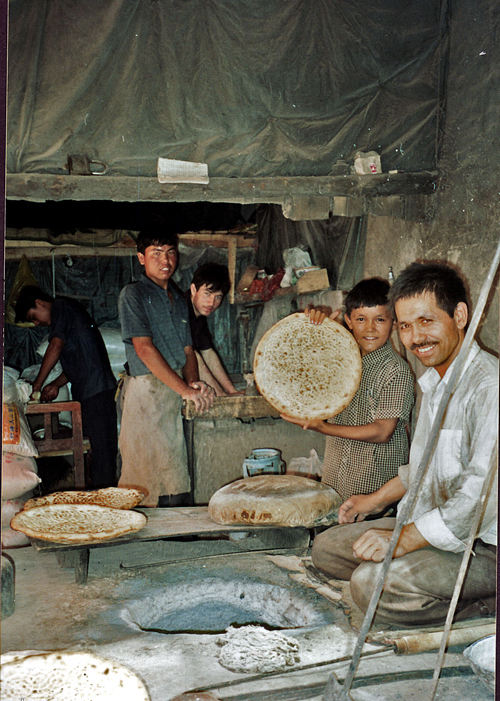 I’m sadden to hear that they are destroying the old Kashgar. The Chinese don’t understand the value of the old ways. Kunming has become this new and ugly concrete monstrosity. I told my taxi driver, take me to see the mud houses of the villagers. I’m glad I saw some just outside Kunming. Great information on this site, I’m glad I found it. In fact it is on my bloglist. it is my home, hey it si my motherland! welcome everyone! I think Beijing has really crossed the tipping point in terms of the redevelopment of the old hutong / pingfang areas. We used to be in a hutong because of the peace and quiet — much harder to get in an apartment building with families on all four sides. It’s really too bad what happened here, but not really to be surprised given the levels of corruption and government involvement in real estate development. I’m hoping to get the chance to go out to Kashkar and hope to see some of what is left. Must be great to have a job that takes you all over China. I’m a little envious. Great blog, incidentally. The photos are beautiful. Thanks for your comments. 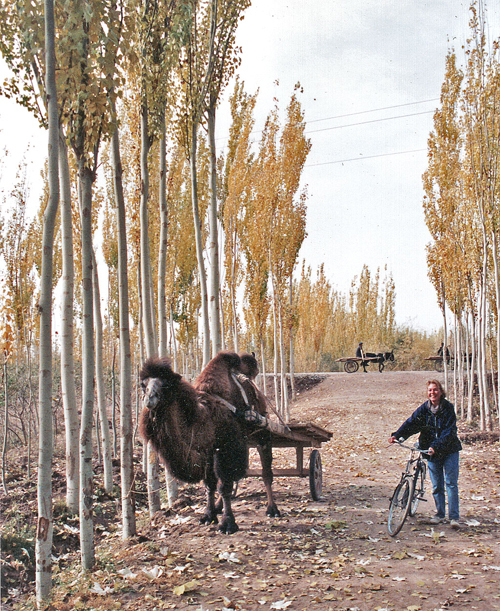 I would still recommend visiting Kashgar. The Sunday Market is wonderful and the locals are really friendly. Just remember that the animal market has moved from the center to near the train station. There are plenty of places worth going to around Kashgar and you can follow the southern Silk route to Hotan for another great market. If you are interested in reading about efforts to protect Beijing’s historic hutongs. Try reading the second chapter of this book, Wild Grass by Ian Johnson. It will dispell any myth that the Chinese aren’t interested in protecting their historic buildings.